Can social media destroy your career? For job-seekers, your social media presence can make or break you. Imagine applying for your dream job. You sit in the chair across from the hiring manager. You look down at your attire: clean and ironed. You’re looking your best. You’ve answered the questions to the best of your ability and you’ve researched the organisation appropriately. The hiring manager unexpectedly turns on a computer. You hear typing. The hiring manager turns the screen around. You see the worst version of yourself in picture form on their screen. You do not get your dream job. Image development and social media strategy expert from La Trobe University Natalie McKenna says social media plays a large impact on how others perceive you. She says the generation who is now applying for entry-level jobs is the one most exposed to social media. The millennial generation has grown up with Facebook, Instagram, Snapchat and Twitter documenting their everyday movements. McKenna attributes this to the need to feed a sense of false reality perceived through online images. “These are manipulated images portraying to younger minds what life should be,” she said. “If I was to hire her, it could have tainted my reputation as well,” she said. However, she does highlight the importance of having a positive online persona. “We are looking for those who present themselves professionally and socially,” she said. 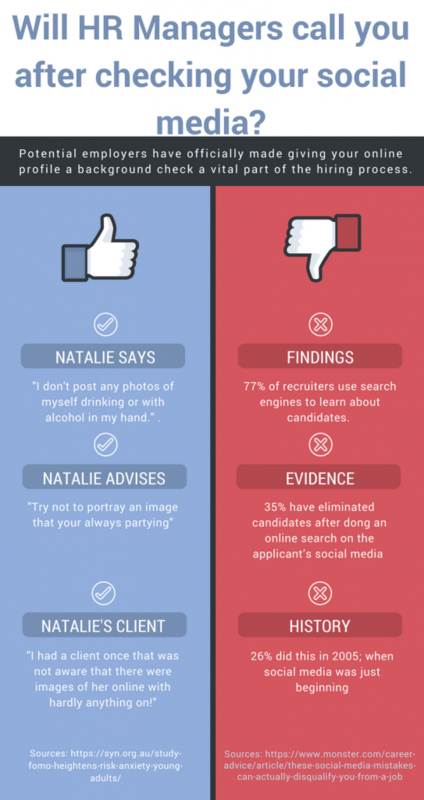 Searching for candidates through social media reflects how job-seeking has changed. Applying for jobs in 2018 is through online applications, rather than the good old handing out of multiple paper copies of your resume. “It does not need to be perfect,” McKenna said. Text and photographs published online can never be deleted. Even if the social media platform has a delete button, the internet stores the information and data elsewhere somehow. “The client I interviewed was not aware that these images of her were on social media and was shocked at the discovery,” McKenna said. Although social media can be dangerous, she wants to highlight the positives it has in job recruitment today. “I believe one of the positives is the networking social media brings and the opportunity to engage and learn from others without leaving your desk,” she said. McKenna emphasises the fact that millennials have been given an advantage in having social media accessible to them from an early age. “The opportunities to discover are endless. If you present yourself correctly and take precautions, then you will succeed,” she said. “Try to portray an image that you won’t regret in the long run,” she said. Monster also reported that according to the SHRM study 77 percent of recruiters use search engines to learn about candidates and 35 percent have eliminated candidates because of their online search findings. If anyone can search you online, what would make a future employer any different? McKenna believes that the majority of millennials have not been educated on the possible vulnerabilities of social media. “I see people crossing the roads who cannot even look up from their mobile devices. Social media is more impactful than people seem to notice,” she said. 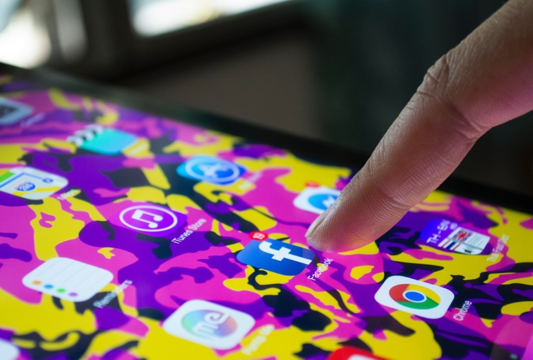 Something this powerful is only going to evolve – the SHRM study confirms 26 percent of recruitment agencies were searching through the social media profiles of potential candidates back in 2005. This was when social media was just beginning – when Mum had more Facebook friends than you and your selfie bathroom profile picture was an accurate portrayal of yourself. Imagine finding your dream job online – through that alumni network you joined on Facebook, perhaps, or on LinkedIn. The job has just been advertised. You’re early in discovering this opportunity. You open your resume – make sure it’s updated and relevant. It’s ready to be submitted. You’re almost finished with your application. The last step is to attach links to your current social media profiles. You check your Facebook, Instagram, Twitter and Snapchat. Are you ready?